Win a 1stFone or OwnFone – Closes 25th July 2013 – Perfect for young children, elderly and disabled. In conjunction with 1stFone, I am giving a phone on my blog. It’s a fabulous peace of mind gadget for a young child or an elderly person who struggles with regular phones. I wrote about the 1stFone we received a few weeks ago and how great it has been for my special needs boy who can’t read or write, yet can still use this phone. I don’t have any problems with young children having a means of getting themselves help rather than approaching a stranger if they are in trouble. I’ve always told my boys that if they get lost, they are to go to the nearest person who looks like a mother with kids. While it’s not 100% foolproof, I do feel like the path of least danger is in the harassed mother whose heartstrings will be pulled and will remain at the scene until someone the boys trusts gets to them. Very young children could have one of these phones tucked into a t-shirt or jumper and give them the confidence that if they find themselves alone, the first port of call is the phone stashed safely away for emergencies. Not that it is just a phone for emergencies as my boy is loving being able to just have a phone of his own, even if it can only dial out the pre-set numbers that we installed on it. They can only call the numbers you approve on the phone and it doesn’t use the Internet, nor can t text. Our one is such a fabulous success that I’ve partnered with 1stFone to offer one lucky person a free handset with the first month of 50 minutes free. If the winner wishes to continue with the phone, they will need to agree to a monthly contract, or can choose to go pay as you go. The winner will be able to keep the phone, and will be able to choose from a 1stFone or OwnFone for seniors. Either phone could be used for special needs children and adults who can’t manage regular phones. The giveaway deadling is the 25th July at midnight so get your entries in. OwnFone / 1stFone reserves the right to amend, add or withdraw this giveaway at any time. The prize will be for one 1stFone or OwnFone with one month of 50 inclusive minutes. After the month is up, you will need to buy airtime, or continue a contract to enable it to continue working. You will be required to set up a direct debit as part of the process of ordering and designing your winning phone and it will be used if you plan to continue using the 1stFone or OwnFone after your trial period, or first 50 minutes are used up. I have been thinking about getting my youngster his own phone. I never knew you could get one of these. Glad I saw this. Great idea – I like the way you can preset the numbers that can be used. I’ve entered because I’ve been looking at these sorts of phone to get for my granddad. He’s very independent but almost blind and 93 years old – it worries us like mad when he takes himself off out and we don’t know if he’s okay or not. I love the fact that the buttons aren’t fiddly and it would be really easy for him to be able to phone one of us on a speed-dial number. Love the restriction on numbers, and the basic layout – even my 3-year-olds could handle this and recognise the words. I have never seen this before….it looks fantastic. What good idea would love it for my grandson. I was only reading about these the other day. Brilliant idea. We had one for review for my son. My daughter get jealous. Hope i win one for her. I actually want to win this phone for my 10 year old brother, he keeps asking my mum for an iphone but that’s on the pricey side and too complicated for a kid. I like that this phone is restricted and that you can quickly contact someone in case of an emergency. It would also make my brother feel more independent but safe at the same time. 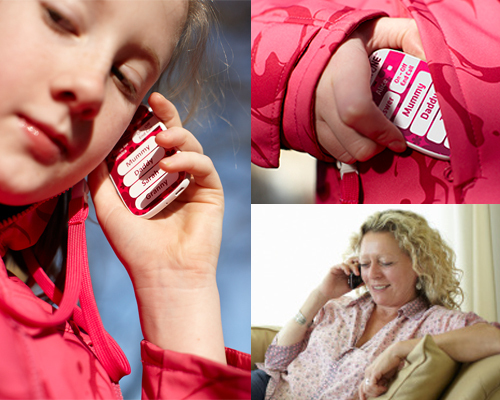 Great 1st phone for a younger child giving peace of mind, ideal for the elderly too, brilliant! My Gran has Dementia. She can no longer use a normal telephone with ease. This phone can restrict who is called, thus she will not dial a wrong number and will always get through to a family member who can help. I’ve entered. I have a disabled nephew and it would solve so many problems and give him back a little bit of independece. Brilliant idea. I like the fact that the child can easily phone their parents at a push of the button! Looks like one of those phones you don’t have to concern yourself about as it won’t run up bills or spend a fortune on downloadable games. Ideal for some Special needs children who may have coordination problems or be in a panic and unable to call for help. The simplicity of this phone is ideal and would certainly put my mind at rest. For the elderly who struggle with new technology, have memory difficulties or have sensory problems, this is once again a brilliant idea. I like this idea, gives me a break! Starting big school – we want one! I like that only certain numbers can be called and no text, it may get little kids used to the idea then hopefully no expensive phone bills when they’re older! Hopefully!! It’s great that children (or my gran) don’t have to remember a number or be able to work through menus to dial. I wouldn’t get the 999 button for my son though, he’d be constantly trying to call Fireman Sam. This is brilliant! My 8 year old daughter plays out nearly every night and this would be a fantastic way to get hold of her at tea time and would save me burning the food. Yep, I think that’s the thing that I am finding it perfect for. I like the sound of this phone. We would love for our elderly relatives to have a mobile phone but they absolutely refuse. I can’t help but feel it’s the fear of the technology. However our Great Aunt (in her 80s) goes off for massive long walks, and if something were to happen to her how would she get help? Maybe this is the solution, easy to use and peace of mind too. I think it would be a good option for many elders that struggle with other phones. I didn’t add 999 as I worried about the getting regular calls from my wee one. I figured that with 8 numbers on his phone, if he went through them, he’d come to someone who could help. If I thought mine would be responsible with 999, then I’d definitely add it. I love the fact that it does what you need it to; be a safety precaution for your child without presenting other safety issues, like access to the internet. Fantastic idea perfect for all ages. It’s fabulous. One of my older kids has also found a use for pinching his little brothers phone so he can put it round his neck to go out and play football. Otherwise his phone falls out of his pocket. Amazing concept, could be just what is needed for the kids of today! I don’t own anything but a basic mobile so this sounds like the one for me! I love the fact that you can personalise it. This looks amazing and would be ideal for my 5 and a half year old son. He has diabetes type 1 and is insulin dependent. This would be a Godsend for me as I would feel much safer knowing he has this for emergencies. Thank you for the opportunity. Brilliant idea – I love the absolute simplicity of this phone. It really is foolproof. This is a amazing idea. It is very clever and very well thought out! Would love to win one. Good luck, I think these would be ideal for elderly too. My mum is 87 and finds her mobile totally bewildering. She only really needs two numbers, me and my brother, and she doesn’t know how to use the phone address book so has to go and look the number up then type it in manually – taking several attempts- for every call. A phone like this would be wonderful for her, it would save her a lot of stress and worry, and save the irritation all the people whose wrong numbers she dials must feel! I have these for my children and will be reviewing them next week. I love the peace of mind they give me to allow them to grow and explore a little more freely. If I won one I would get an ownfone for my Grandmother. With a 3yr old and 6yr old to keep track of, it’s always a worry that we will get separated in a busy place. I know both of my children would be confident in using a phone like this. I wish they had been around when mine were smaller. It would have saved a lot of worry out and about. Sounds great – I love that it gives you peace of mind! I like the fact that you can restrict who can be called on the phone. That’s the best bit about it I think.